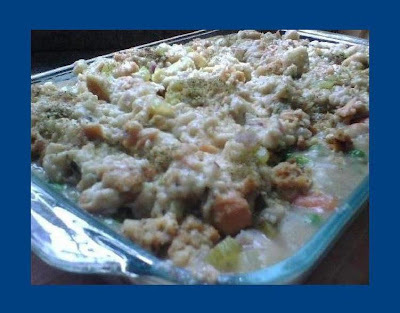 Here's a repost of Jeanie's "day after Thanksgiving" dish. It's so good that it's worth reposting and it still hits the spot. Well, once again my sister Jeanie has created a fabulous 'feed a crowd' dish. She's good like that, you know? I love that I'll be at work, just going about my day, and I'll receive a random picture message on my phone of whatever new dish she's just created. When she first described it to me, all I could think of was "what's not to love?" It seriously screams "comfort food", and you know how I love that! This is the perfect recipe to use up Thanksgiving leftovers. Thanx My Jeanie! 1. Cook potatoes – I put them in a skillet with a little oil, seared them for about 10 minutes, then added some water to cover, put a lid on and cooked for another 5 or 10 until tender. Drain and place into bottom of a greased 13 x 9. Set aside. 2. In a large skillet, saute celery, onion and carrots in a little butter until tender. Add chicken broth, poultry seasoning, sage, rosemary, bay leaf and thyme. Bring to a boil and simmer for 10 minutes. 3. In a small bowl, dissolve 1/2 cup flour in about 1 cup of water, whisk until smooth, and add to skillet mixture. Add jar of turkey gravy. Simmer until thickened. 4. Add diced turkey and frozen peas (no need to thaw them). 5. Pour entire mixture on top of potatoes in 13 x 9. 6. Prepare the Stove Top as directed and sprinkle over top of the casserole. 7. Bake at 400 degrees for 20 to 30 minutes or until bubbly. Clearly, you could use chicken instead of turkey and switch the vegetables to suit your own tastes or to use up whatever you have leftover! That's so funny!! That's what I do with my leftovers from Thanksgiving. It's like having the whole dinner in one dish! !